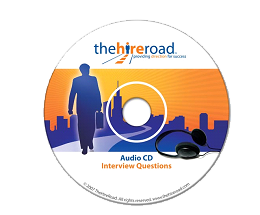 TheHireRoad - Interview Questions (Audio CD Presentation) - Don't Miss This! Interview preparation is the key! Listen to a discussion of almost 100 questions you may be asked during the interview, as well as questions that you should ask hiring managers. With questions listed by track number, you can listen to this unique audio CD anywhere, even in your car on the way to your interview! Interview preparation is the key! Listen to a discussion of over 90 questions you may be asked during the interview, to include: 15 questions that you should consider asking the hiring manager. With questions listed by track number you can listen to this unique audio CD anywhere, even in your car on the way to your interview! Order within any of our PLATINUM RESUME PACKAGES or order separately here. Interview Q & A Audio CD with over 90 Interview Questions to include questions you may want to ask the Interviewer! Listen to it in your car! Listen to a discussion of 79 questions you may be asked during the interview, as well as 15 questions that you should consider asking the hiring manager. Personal Questions, Knowledge Questions, Situational Questions, Experience Questions, Stress Questions, and Salary Questions. With questions listed by track number you can listen to this unique audio CD anywhere, even in your car on the way to your interview! Order within our PLATINUM MILITARY TO CIVILIAN PACKAGE or order separately here. 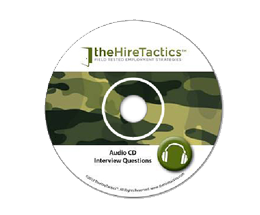 INTERVIEW Q & A Audio CD for Transitioning Military Personnel - Q & A Audio CD with 79 Interview Questions and 15 questions you may want to ask the Interviewer. Listen to it in your car!